Oxidative stress has been found to be implicated in the development of Alzheimer’s disease (AD). In this meta-analytic review, we compared tissue levels between AD and non-AD brains of selenium, an important biological trace element well known for its vital role in the brain function. We included 14 studies with 40 observations on selenium concentrations in AD and control brains. The effect size as standardized mean difference (SMD) was generated using review manager 5.3. Random-effects meta-analysis indicated a decrease (SMD = − 0.42) in brain tissue selenium levels in AD as compared to non-AD controls. The subgroup meta-analysis demonstrated that the selenium levels were decreased in the temporal, hippocampal, and cortex regions in AD. The funnel plot with Egger’s (p = 0.88) and Begg’s tests (p = 0.24) detected no significant publication bias. The results of sensitivity analysis indicated that no single study/observation had significantly influenced the overall outcome. This meta-analysis provides consolidated evidence for a significant decrease of selenium status in AD brains compared to controls. 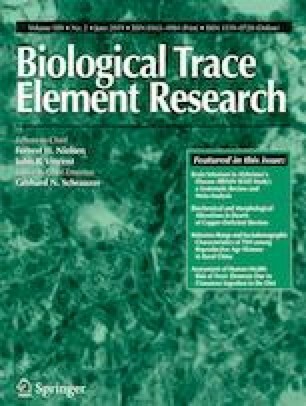 In line with the evidence supporting selenium’s antioxidant role and the involvement of oxidative stress in AD development, this meta-analysis supports new therapeutic strategies aimed at brain tissue selenium homeostasis in AD. The online version of this article ( https://doi.org/10.1007/s12011-018-1492-x) contains supplementary material, which is available to authorized users. Dr. V.S. Reddy is very much thankful to Prof. Tiejun Tong and Luo Dehui (PhD Scholar), Department of Mathematics, Hong Kong Baptist University for their statistical expertise and help in the methodology. A special note of thanks to Varikasuvu Sahasra Bhairavi for the time I could not give you during this work. VSR designed the study, conducted literature search, performed analysis, and wrote the manuscript. SP and JK participated in literature search and revised the manuscript. MM assisted in literature search, selection criteria, and data collection. All authors read and approved the final manuscript.